There is a little color difference between the product and the picture. 1.If you have any questions before the purchase, please click "Customer Question & Answers" to ask, we will reply as soon as possible. 2.We offer best quality bands and excellent service. If you like our bands, please feel free to recommend it to your friends. If you have any suggestions, please share your comments with us. Thank you for your help and support. 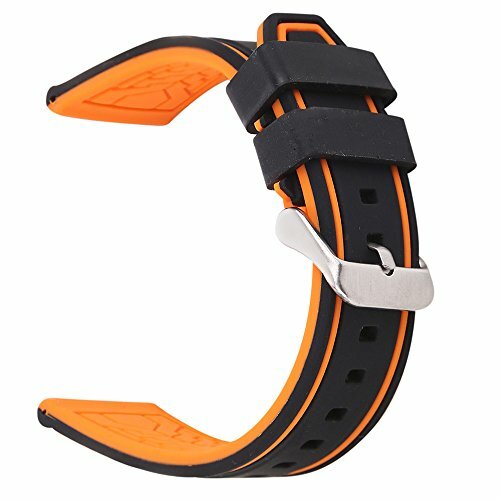 band material: silicone rubber,soft durable and waterproof.buckle material:316 Stainless steel, band color:black orange,Splice double color.buckle color: brushed silver.band width: 20mm,buckle width:18mm. the thickness is 4mm-5mm approx,replacement band, can fit traditional watch,rough watch and military watch.Please note:this band fit for the watches with less than 2mm in diameter spring bar. Length:125mm/78mm without buckle,can fit 130mm-205mm(5.2in-8in) wrist approx. If you have any questions about this product by EACHE, contact us by completing and submitting the form below. If you are looking for a specif part number, please include it with your message.